It looks like Pier 55, a $250 million construction project on the Hudson River, will be moving forward—for now—after receiving the required permit modification approval from the U.S. Army Corps of Engineers on June 5. This approval of the design changes is the latest development in this project’s history of lawsuits and controversy. In March, the federal court vacated the permit based on the Clean Water Act, citing concerns that the pier’s construction would impact the river’s estuarine sanctuary. In turn, the Hudson River Park Trust and the Army Corps of Engineers filed an appeal and a modified application addressing those issues. 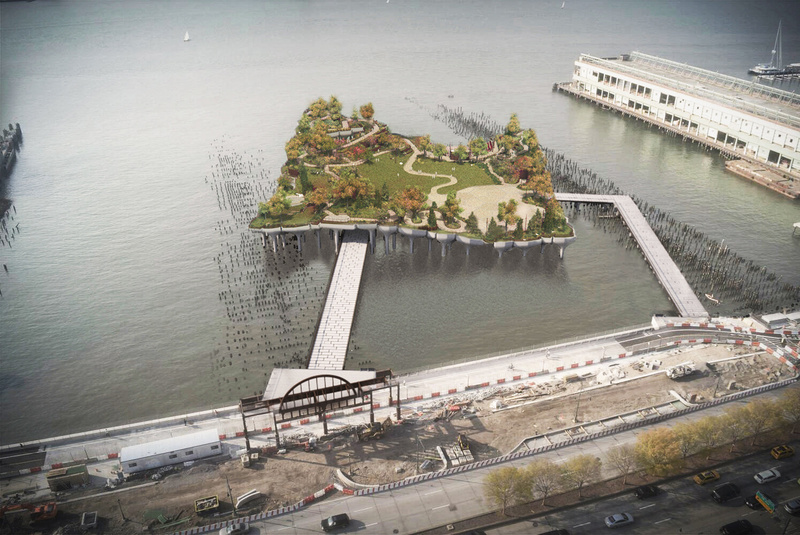 The revised application for the 2.7-acre public park and performance space proposed the use of non-concrete fill for the piles supporting the pier as well as the removal of an adjacent barge. Designed by Thomas Heatherwick and funded by Barry Diller and his wife, fashion designer Diane von Furstenberg, the project has been advertised as an extension of the Hudson River Park with ample recreation space. The project has prominent supporters, including New York Governor Andrew M. Cuomo, who applauded the decision to issue a modified permit. “The development of Pier 55 will ensure that the park continues to attract millions of residents, tourists and travelers each year, while showing off the very best that New York has to offer,” he said in a press release. The main opponent of the project, the City Club of New York, has been filing multiple lawsuits against the Trust in an attempt to halt construction. Besides the environmental issues of building on the river, the group argues that the development of the project has been kept out of the public eye.